The September WER report provides an overview of the three FSRUs and FSO contracted over the previous month. We also review the sequence of events leading to Petrobras cancelling the Libra Pilot and Sepia FPSO tenders and describe plans to restart the competition with revised rules. 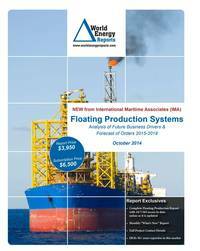 In the data section of the report are details for 194 floater projects in the planning stage, 55 production or storage floaters now on order, 281 floating production units currently in service and 31 production floaters available for redeployment contracts. Charts in the report update the location where floating production and storage systems are being planned, operating, being built and to be installed. Accompanying excel spreadsheets provide the report data in sortable format. Information is current as of 19 September.